Now Uggs are not cheap, but they are stylish, well made and will last you for years. And we can confirm that there is an Ugg student discount to with a standard 10% reduction. To get the special code, go to this page on ugg.com, validate your status and you’ll get a short-time code to use at the online check-out. Even more great news is that there is an outlet page on ugg.com that has savings of up to 70%. Uggs have established themselves as a premier footwear brand worldwide. While the classic Ugg boot sent them stratospheric, they now do an extensive range of womens and mens boots, shoes and slippers. Is there a Ugg UNiDAYS, NUS or Student Beans Discount? 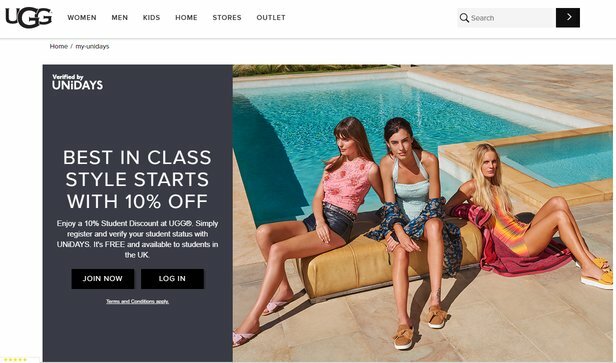 The great news is that there is a standard Ugg student discount code for 10% off and you can use it on all full priced items at ugg.com/uk. Go to the special student page on ugg.com/uk. Verify your student status by logging on to Unidays (you can do it at the page above). Generate your unique Ugg student discount code. At the check-out enter your student code in the promo code box. The reduction will automatically be made. It’s a great system and easy way for students to get a fantastic discount on their Ugg footwear purchases. If you’re in a Ugg store then officially you can’t get a student discount. However, we recommend showing some valid student id at the till and asking. You never know your luck. Even though there is an Ugg student discount, we’ve found that there are more ways to save as we’ve been researching this guide. 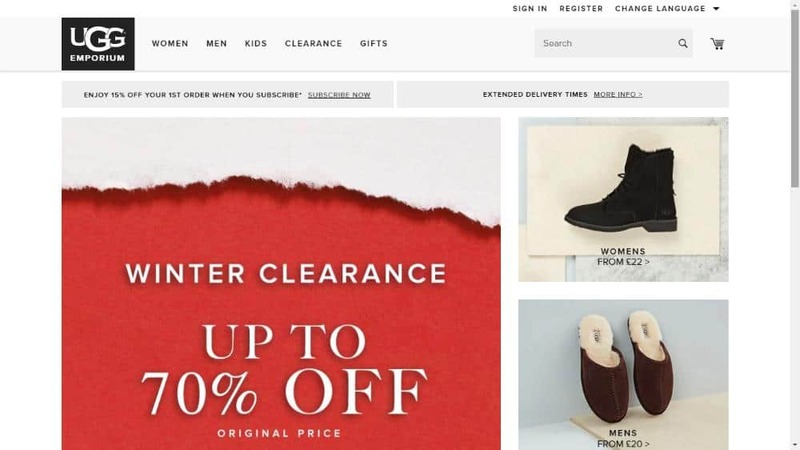 Did you know that there is an Ugg sales page on their website? This lists all the shoes, boots and other items that are discounted. Unfortunately the student discount code won’t work on sales prices but you’re getting a bargain anyway and saving so it’s all good! There are periods throughout the year where Ugg distribute online promo codes that anybody, not just students, can use. These have included free delivery, 20% off everything and extra 10% off sale footwear. This is regularly updated with some of the best offers, sales and deals that Ugg offer. Did you know that if you sign up to the newsletter on Ugg.com then you get exclusive deals, offers and codes. It’s annoying when you get to the check-out online and find that there is a big delivery charge to pay. We’ve often abandoned our carts because of this. Thankfully this isn’t an issue as Ugg offer free standard delivery. Exchanged and returns are also free which is a nice touch. 3. Is there a Ugg UNiDAYS, NUS or Student Beans Discount? There are now quite a few different student discount schemes in the UK and it can be difficult when you’re looking for a specific store to get a reduction, like Ugg for instance. The 3 biggest ones are NUS, UNiDAYS and Student Beans. We get asked a lot whether there is a Ugg student discount through these schemes so we’ve done some extensive researching so we can answer your questions properly! There is a Unidays Ugg promo code available to get you 10% off your purchase online. To get it you need go to this page on Ugg.com, follow the instructions and get verified with UNiDAYS. You can get a Ugg NUS discount in-store as your card will be valid student id. We can confirm that there is no Ugg Student Beans code. It doesn’t appear listed on the Student Beans website. Still, the 10% standard through Unidays is a bonus! No longer just a boot brand, Ugg have branched out into a range of footwear spanning men’s, women’s and kid’s, but maintaining the overall look of the brand – you’d still recognise an Ugg as an Ugg, even if it isn’t the chunky fur-lined boot that we’re used to! You can also now find hygge-style Ugg homeware (think chunky cushions and heavy knitted fabrics) and luxury loungewear that matches your boots perfectly but keeps you cosy and warm indoors as well as out. There are a number of dedicated Ugg physical stores in major capital cities worldwide, but you’re more likely to find them stocked in third-party shoe retailers and concessions elsewhere. Their website ships internationally, and if you check back regularly here at Student Discount Squirrel, we’ll update discount codes and offers right here for you to use online, so don’t shop until you’ve checked. Ugg footwear is crafted using sheepskin and so is often a target for animal-rights groups. However, the brand has worked hard in recent years to increase the quality of their products by sourcing as ethically as possible and introducing a strict animal welfare standards policy. The sheepskin now used in animal products is a by-product of sheep raised for food, making up approximately 10% of the profit made by lambing farmers. Ugg now requires all of its suppliers to adhere to vigorous animal welfare protocols, and never sources from any farmer who raises sheep for their skin alone. You won’t find more ethical sourcing of sheepskin for footwear on the high street; so rest assured you’re shopping guilt-free and in the most moral way you can for shoes containing animal products. Ugg’s latest collection is a celebrates authentic Native American craftmanship, with products focused on all-American materials and using only the highest quality of genuine tribal craftmanship. Many think Ugg to be an Australian company, but in fact, it was founded back in 1978 by Australians Brian Smith and Doug Jensen when they lived in California. They were originally the United States distributor for another brand of sheepskin boot, but quickly became unhappy with the quality and so launched their own brand. Friends and family of the paid invested a combined $20,000, and Ugg sold 28 pairs of boots in their first year. The brand really hit mainstream attention in 1994, when they were worn by the US Winter Olympics team in Lillehammer, and the year after, the business was bought out. Branching out internationally, the boots gained celebrity status when featured on the Oprah Winfrey show, and from there, celebrities of all shapes and sizes were photographed wearing them; including Kate Upton, Kate Hudson, Blake Lively, Tom Brady, Leonardo DiCaprio, Cameron Diaz and Sarah Jessica Parker. Ugg continued to grow despite its waning celebrity appeal as the years went on, and diversified out into men’s footwear ranges and then children’s. Adding to their collection with accessories, the brand has since collaborated with the likes of Jimmy Choo and Disney and continues to enjoy international success in all climes. Ugg is now such a household name that most of the general public in the Western world would be able to identify the brand just on the shoe’s shape alone – and that takes some doing! It you haven’t found what you are looking for at Uggs – check out the retailers below who we think you may like!